The PGA Tour's FedEx Cup Play-Offs head to TPC Boston for the Dell Technologies Championship, the second of three stages, which whittle the field from the original 125 who topped the regular season rankings, down to the 30 men eligible for the Tour Championship. Last week's action at Ridgewood Country Club leaves us with just 100 golfers and by the end of this week's action (which actually finishes on Monday) there will be only 70 left standing for next week's BMW Championship. TPC Boston has been a regular tour stop since 2003. A 7,342 yard track which plays to a par of 71 it favours the big hitters and 2010 winner Charley Hoffman explained why. "The fairways are wide and the cross bunkers, if you hit it longer, you can carry them," he said. "It's definitely the guy who hits it longer has an advantage on this golf course." Ten of the 15 course winners have also claimed major championships. A recent trend to note is the last four winners were all at least four shots back at halfway. In his book 'Slaying the Tiger' author Shane Ryan highlighted a common thread during the early years of Jordan Spieth: throughout his amateur career he had a habit of enduring a near-miss in a tournament prior to returning and making up for it in style - and it's a trend that has maintained into his professional career. The Masters in 2015, the Australian Open and Dean & Deluca Invitational wins of 2016: all victories that came one year after he finished second. The 2015 Tour Championship, 2016 Tournament of Champions and 2017 Open: each of them wins two years after he was second. Following him wherever he has finished second is not an infallible method. He was, for example, second at The Northern Trust last year, but only T25th last week. However a third round 64 was another sign that he is far from a spent force. If it plays as it always has, the greens should be quick and he prefers that. In fact he made a point at Royal Birkdale of how he needs them to perform at his best. Take the 22/1 each way with Unibet. Patrick Reed enjoys a bit of needle. His college career revealed as much (when he was a success despite, or perhaps because of, a fractious relationship with both his team-mates and opponents). His Ryder Cup performances have enhanced that reputation, as did the fact that he won his first major at a location (Augusta) so entwined with his troubled past. Lleyton Hewitt, the Australian tennis player, used to focus on one member of the crowd when he was in need of geeing up. He would seek this person out and holler at them after points. He fed off the energy of this contrived relationship. In a similar vein Reed has often talked of how much he enjoys being among a raucous gallery and it is perhaps no surprise that he has a strong record in New York and Boston, two of the more combative sporting cities in America. Since his first two visits to TPC Boston (four sub-70 rounds and three poor ones) he has caught fire, finishing fourth, fifth and sixth. It's easy to believe his recent form is poor because in the first half of the season he notched seven top tens in nine starts. He's not been at that level in the last few weeks, but he's only once been outside the top 30 in his last seven appearances. His Strokes Gained long game stats were decent last week and he's been at home on these greens in the past. 7/1 for a top five finish with Coral is a nice price. 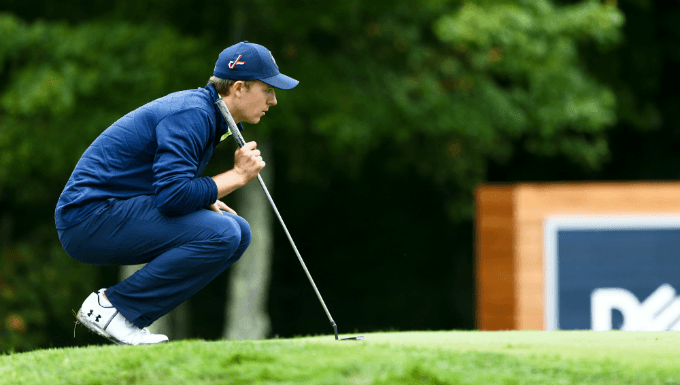 He's a course debutant this week, but Aaron Wise has proved this season that first looks are not necessarily going to stop him having a good week. The run started with second in the Wells Fargo Championship, one week before his win. More recently he was tied sixth on debut in the WGC Bridgestone Invitational and tied fourth last week at Ridgewood. Paddy Power make him an 8/1 shot for another top ten , which is worth taking on.